DietSensor (dietsensor.com)-A pocket-sized, Bluetooth connected, molecular sensor called SCiO that uses an infrared spectroscopy to determine the chemical makeup of food and drink. YOFiMeter (yofimeter.com)-Enables people living with diabetes to wirelessly transmit their blood sugar levels, biometric data, and voice notes to caregivers and providers using a secure network with AT&T. Nima (nimasensor.com)-A sensor type device that can analyze food in about two minutes, to tell you if your food contains 20 ppm or more of gluten in its chemical makeup. Diabetes Pilot (diabetespilot.com)-A new digital app that allows the user to record all of their data in one place (glucose, insulin, medications, meals, blood-pressure, etc.) so the results are at your fingertips the moment you need them. 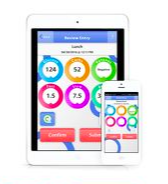 BlueLoop (blueloop.mycareconnect.com)-An easy-to-use Web and mobile-based software program that works as a care coordination tool for someone of school age living with Type 1 Diabetes.